The car went into production on Thursday 8th May 1997 and was completed 23 days later, on Wednesday the 21st May 1997. Delivered new and first registered on Italian export plates, ******** on the 5th June 1997, to 50 year old Mr A T of Milan by the Ferrari main agents in Milan, Rosso Corsa S.R.L. The then UK list price (01.03.97) was £143, 684.88 plus delivery, number plates and road tax. The car was brought to the United Kingdom, apparently as part of a deal with classic car specialist Duncan Hamilton, who sold the car to Mr H P of Kent and was to form part of his own private collection . H registered the car for the first time in the UK on * *** on the 14th August 2003 with some 7,600/4,700 miles now covered . It was sold by H to the penultimate owner, Mr R C of Hampshire on the 8th November 2006, with some 16,000 kilometres/10,000 miles. Mr C had former Maranello Concessionaires technician, Neal Lucas maintain the car over his period of ownership. Just short of two years later it was purchased by the last owners, Mr and Mrs A J of Essex on the 28th November 2008 with 28,956kms/18,097 recorded miles. The car was purchased to drive to their house in Southern France. 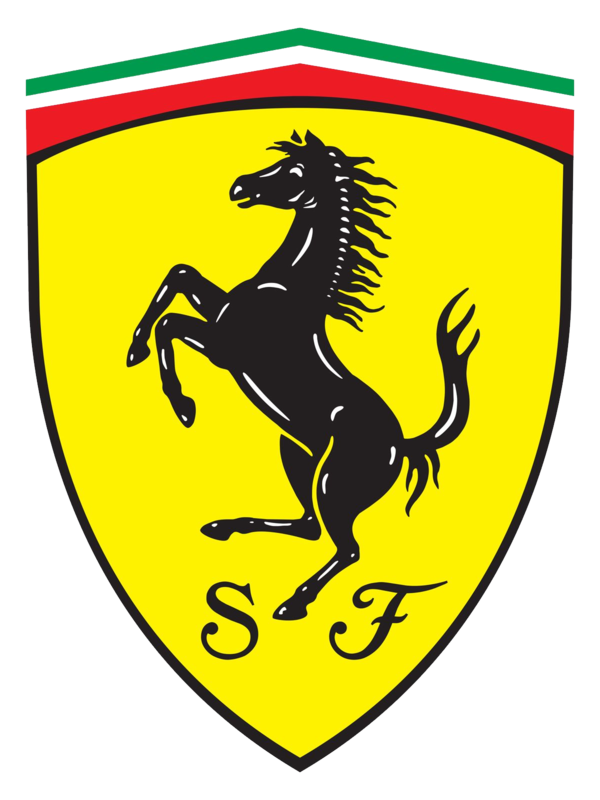 Becoming permanent residents of France themselves, the car was registered in France in September 2009.The car has continued to be maintained by Ferrari main agents and trusted specialists. History: Launched to the press at the Nurburgring in 1996, the 550 Maranello was Ferrari’s answer to those who believed the performance of a front-engined V12 car could not beat that of a mid-engined sports car. The successor to the F512M, the 550 Maranello proved quicker and, thanks to its better front-engined, rear drive packaging layout, far more practical. The 550 Maranello also benefited from Ferrari’s maniacal attention to aerodynamics with a low Cd (0.33) and constant downforce over both axles. The combination of uncompromising performance and aerodynamic efficiency helped the car establish new production car speed records on the 12th of October 1998 in Marysville, Ohio, covering 100 km (62 miles) at an average speed of 304.1 km/h, (188.88 mph) and 296.168 km/h (183.955 miles) in one hour. After over two decades of Ferrari production with a mid engine model as the performance pinnacle of the regular production range, the tables were turned in 1996 with the introduction of the 550 Maranello. The new model had a front mounted engine like its 456 GT stable mate, and had been developed from the technological progress and innovations of that model, to produce searing performance allied to impeccable road manners. The 550 Maranello made its public debut at a major Ferrari gathering at the Nurburgring, Germany, in July 1996, which centred round the launch of the new car. The then current F1 team drivers Michael Schumacher and Eddie Irvine were on hand to put the car through its paces on the track, along with a host of previous Ferrari team drivers including former Ferrari World Champions Niki Lauda and Jody Scheckter. The body lines from the pen of Pininfarina unsurprisingly had echoes of the new model’s 2+2 stable mate, the 456 GT, in the overall premise. However, there were also retro hints from earlier classic models, like the twin exhaust air slots in the front wings akin to those of the sixties 250 GTO and 275 GTB, whilst the tail light treatment was even closer to that of the fabled 365 GTB/4 “Daytona” model than it had been on the 456 GT. The new model did have its own positive identity, with a shallow and wide radiator air intake, which with the integral front spoiler gave the look of a hungry shark approaching your rear view mirror, when being followed along the road by it. The styling details gave it an appearance of aggressive elegance, and although some people were initially a little subdued in their praise, no doubt expecting something more visually radical, the dynamic qualities of the car soon won over the doubters. After all, here was a totally practical and comfortable 2 seat model, with plentiful luggage space, that had overall performance close to that of the bare bones F40 “racer for the street” of less than a decade earlier. Technological advances during the intervening period, particularly with regard to suspension and traction control systems with electronic brains, meant that a front engine car could be made to handle as well as a mid engine model. One feature carried over from the preceding F512M model was the use of high intensity homofocal covered headlight units, that obviated the necessity of the retractable units of the 456 GT, and thus gave the car a homogeneous line whether the lights were in use or not. The bodies were mounted on a 2500mm wheelbase chassis, which was 100mm less than the 456 GT 2+2 model, with a front track of 1632mm and rear track of 1586mm. It was constructed in the traditional steel tube fashion, incorporating substructures to support mechanical and body components, bearing factory chassis type reference F 133 AB. The model was available in right or left hand drive form, with power assisted steering as standard. The body was a lightweight aluminium alloy welded to the steel frame via a specially formulated sandwich material called Feran, which permitted the welding of the two dissimilar metals, whilst the front and rear valances were composite mouldings. Independent suspension was provided all round with front and rear anti roll bars, and electronically operated driver controlled variable shock absorber settings, to provide either “normal” or “sport” mode, integrated with an ASR drive control system. When in “normal” mode the brain places an emphasis on stability relative to road conditions, reducing power to the driven wheels via the engine management system, or bringing the ABS braking system into play, to maximise traction. When in “sport” mode the brain provides the driver with the facility to control the situation by his or her own inputs. The adjustable dampers were provided with an electronic “brain” that monitored various factions, like steering angle, road speed, braking effect or acceleration, to optimise the settings for the driving conditions. The steering was of the Servotronic speed sensitive power assisted type, the degree of assistance varying with road speed, being greatest at parking speeds and reducing as speed increased. The standard road wheels were stylised renditions of the traditional five spoke “star” alloy design, featuring elegant convex spokes and five bolt fixing with 18&#8243; diameter rims, 8.5&#8243; wide at the front and 10.5&#8243; wide at the rear. Four wheel ventilated disc brakes were provided, each disc having a four piston light alloy calliper, plus a four channel ABS anti skid braking system, integrated with the ASR drive control system as mentioned. The engine was a derivation of that designed for the 456 GT with the same cubic capacity, although the total cubic capacity was chosen as part of the model title, 5.5 litres (hence 550) rather than the single cylinder swept volume figure that had been used with the 456 GT, with factory type reference 133 A. The 65 degree V12 engine had an actual cubic capacity of 5474cc, with a bore and stroke of 88mm x 75mm, four valves per cylinder, twin overhead camshafts per bank, and dry sump lubrication. The block, cylinder heads, sump, and sundry castings were constructed from light alloy, featuring Nicasil treated alloy cylinder liners, and titanium alloy con rods. A Bosch Motronic 5.2 combined fuel injection/ignition engine management system was fitted, plus a variable back pressure stainless steel exhaust system, to provide a claimed power output of 485bhp at 7000rpm, driving through a six speed + reverse transaxle. The interior was upholstered in leather as standard, with electronic adjustment facilities for the seats, and a large luggage platform behind them. Twin airbags were provided, as was air conditioning, electric windows and door mirrors, plus a stereo system with CD player. As an option sports seats were available, along with a range of items from the “Carrozzeria Scaglietti” personalisation accessories that were introduced in 1997, to enable clients to individualise their cars. The 550 Maranello was produced between 1996 and 2001, and all were numbered in the continuous chassis number road car sequence in the range 99928 to 126807. In 1999 a limited series of thirty three “World Record” examples were produced to commemorate the World Speed Record set at Marysville in the USA on 12 October 1998. Here the 550 Maranello broke the world speed record for a production road cars, covering 100kms at an average speed of 304.1kph (192.60mph), and covering 296.168kms (184.164 miles) in one hour, despite making a stop to refuel. The 27 November 1996 issue of the British magazine “Autocar” featured a road test, where they recorded a 0-60 mph time of 4.6 seconds, a 0-100 mph time of 10.1 seconds, quoting the manufacturer’s claimed top speed of 199 mph. They also proclaimed it “Britain’s Best Driver’s Car 1998&#8243;, and in 1999 said of it “it continues to be the best GT on the block”. Whilst every effort is made to ensure that the above details are correct, we do not warrant that such details are accurate. You are advised to verify them for yourself.